"Poukoura" The golden rays of a new day casts its brightness on the pillar of our dwelling. This is what this property is all about. A brand new bach situated on a private beach shared by the owners Ash, Michelle and their three sons. Access to two other private beaches can be made easily by foot. The house is situated on the historic site of the Purerua Mullet Canning Factory owned by W Mountain in the early 1900's. It is a short drive to Marsden Cross where the first church service was held in New Zealand. The township of Kerikeri is 25 minutes away where there is a wide range of restaurants, wineries, cafes and all the usual amenities you may require. 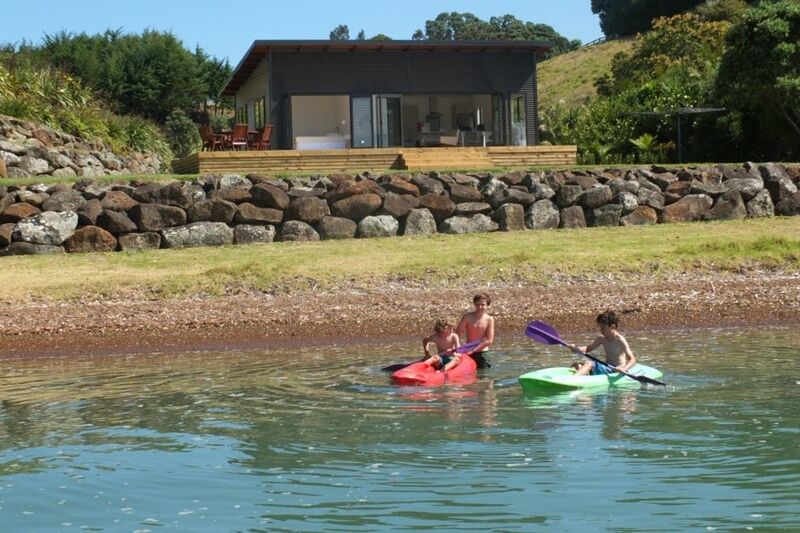 Russell and Paihia by boat is only 15 minutes away. If you don't have a boat fishing off our floating pontoon or the rocks is always a lot of fun and you can be guaranteed to catch a fish whether it is small or large. A lot of fun can be had water skiing, wakeboarding and speeding around on the biscuit at all tides. No more than five people. No animals allowed. No tents, caravans or campervans allowed. Please be aware we are on tank water and water is very precious. Property to be left in the same condition as when you arrived otherwise additional costs will be incurred. A fantastic place with fantastic hosts. We stayed for three nights while working in the area, Ash and Michelle's place had everything you could wish for. Will be returning on holiday over summer! What a find! Thank you for sharing your slice of paradise with us. What a find! Thank you for sharing your slice of paradise with us. Absolutely nothing negative to say about this bach. The beach was enjoyed daily by our kids, our children loved fishing off the wharf (although no keepers the novelty of catching something wasn't lost on them). The bach is immaculately presented inside and out. Sad to have had to leave, but we will be back! I've been raving about this place since the day we arrived. Thank you! Perfect quiet restful place to end our 2 month holiday in New Zealand. Brilliant Location, spectacular views....Michelle and Ash were very friend,y and welcoming. Great facilities for boat launching etc. Would definately stay again. Amazing stay, the place was everything we needed and more, and Michelle was a great host :) thanks so much!!! Amazing location, super clean and tidy and has everything needed for a weekend getaway.